When I come to think of the national dish of Palestine, I think of musakhan (layered dish of bread, onion and sumac topped with chicken and pine nut). But many others would think of maqluba. 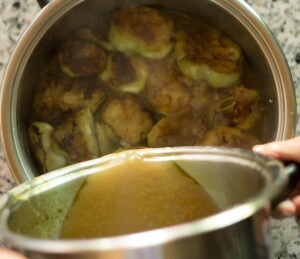 Maqluba (means upside down in Arabic) is a very popular dish among Palestinians and Jordanians alike, they get really excited when it’s served on the table. It’s basically a layered pot of meat, vegetables and rice. Cooked all together and then flipped over a serving big flat platter, making this beautiful cake-like form. Maqluba has a couple of variations in ingredients ; some make it with chicken and cauliflower, some prefer it with lamb and eggplant, while some others make it with cauliflower and eggplant, and add other vegetables like potatoes, tomatoes, and green peppers. Vegetables can be deep fried or just slightly sautéed. It can be with or without meat. Heat 1 tablespoon of vegetable oil in a saucepan, add onions and lamb chops and stir over a medium heat for couple of minutes. Season with salt, black pepper, allspices, cardamom, cinnamon, and bay leaf. Add 4 cups of water, cover the pot and let simmer until cooked (cooking time varies from an hour to two and half, depending on meat type). Meanwhile, heat the rest of vegetable oil in large frying pan. 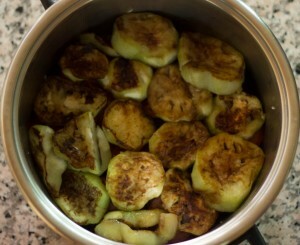 Add eggplant slices and sauté both sides until golden brown. Place them on paper towel to absorb oil and set side. 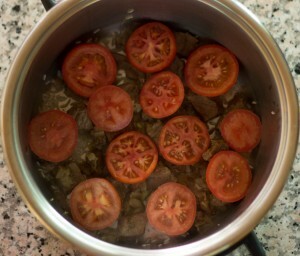 In a big pot, add a small pinch of rice (to avoid burning of the meat). Arrange lamb chops, tomato slices, eggplant slices in layers. Pour lamb stock, and then add rice. Add a small pinch of salt (optional). Bring the pot to a boil over a medium heat. 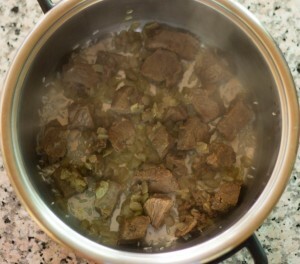 Then cover it and turn the heat down to low and let simmer until rice is cooked (from 20 to 30 minutes). Leave the pot to cool for 15 to 20 minutes, and then carefully flip it up-side down over a serving platter. 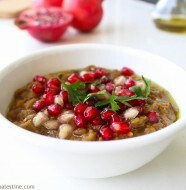 Serve hot with fresh yogurt or Arabic salad. 31 Comments on "Maqluba With Eggplant and Lamb"
Delicious Eman, as all your recipes are, our favourite is the stuffed kibbeh roll. 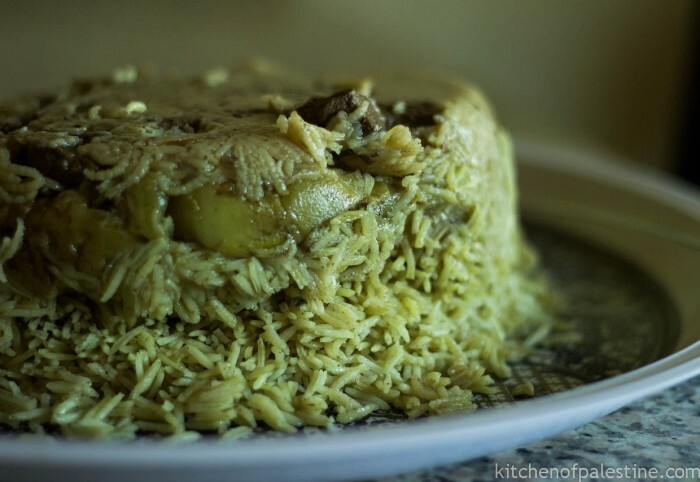 this is one of the most exquisite, aromatic and delicious dishes from Palestine and Jordan… .my mouth is watering! whats a good tip so the that it comes out of the pot in piece! i have made it several times where it has and other times where it hasnt..ty in advance,,please keep the recipes coming..
Just stumbled on your blog today and I’m really liking what I see. Gorgeous food! Thank you Rosa :) happy to have you here..
Caramelized onion like in Mjaddara? Sounds interesting.. In this recipe, I sauteed a whole chopped onion with meat and then I added them along with stock after layering the pot with meat and tomato. I have made this 3 times and it is delicious!! I was wondering if you use cauliflower and chicken, do you use the same spice combination? Yes same spices for cauliflower maqluba. Mom sometimes adds a little pinch of cumin to the cauliflower after cooking them. Hi! this recipe looks delicious! I was wondering if you think it could work in a slow cooker/crockpot. 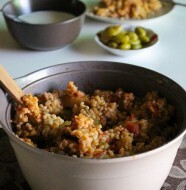 I’m going to Ramallah in the spring, and am trying to make some of the dishes I might be trying! I’m in college, so crock pot meals work better with my schedule. your whole blog looks great, I look forward to trying the dishes! I was in Bethlehem, and at a restaurant called the Taj Mahal…oMG, the food was amazing! Main dish was eggplant, fresh pita, the best I have ever had…lamb…. Even though anyone may use any spice combination which they find appealing, yours here does not convey any traditional Middle-Eastern taste. Cloves are almost never used in stews as a flavor substitute to allspice. Same goes for nutmeg and for paprika which seems the dominant spice in your mix. The most authentic spice mix for this dish is the one suggested by the author in the recipe. I’d stick to it. I should have said you should store this in an airtight container and use according to your taste. Start maybe with 2 to 3 teaspoons in your chosen recipe and adjust the amount to your taste the next time you make the same recipe. I was also curious if you think this recipe could work in a slow cooker? Any thoughts of what would need to be changes to use a slow cooker? I was wondering what cut of lamb is it? Stew cut? It sounds fantastic and I will try it this weekend but you have forgotten to say how much lamb stock in the recipe ! 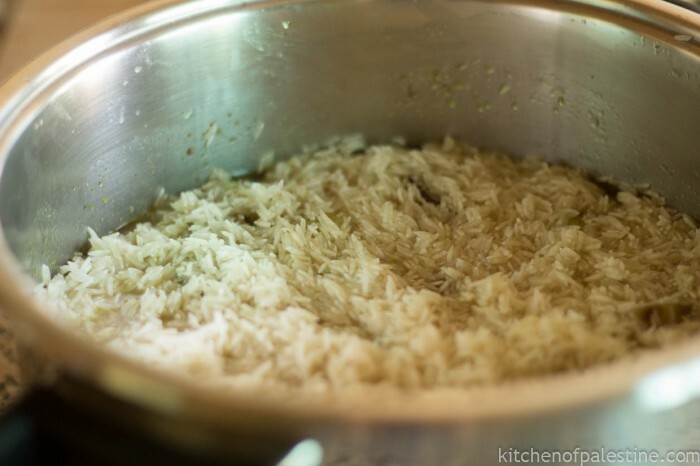 I cook rice a lot so will use the stock in proportion as I normally do. 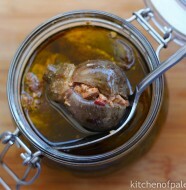 I usually use all the lamb stock for this recipe (the one I used for cooking lamb). It should barely cover the rice. Salam, hi I am from Malaysia. During my study, I always eat this with my friend from Palestine (He cooked for me of coz). May I know the ingredients of mix spices that you use for maqluba? Great recipe Eman. I made this dish many times and its always a hit. We make it differently in Northern Iraq with cumin and curry but I think the cinnamon / allspice combo is way better. I also like to add a layer of potato slices since my kids are not into eggplant much. bone-in lamb is what I use. I also make a yogurt / cucumber salad (Jajeek) with plenty of garlic and mint that goes really well with this. Thank you so much! My kids love it. Which type of rice do you recommend? I like to use brown rice but it usually take a bit longer to cook. Will that be a problem? I am late to your party but am glad I found your site. This dish looks complex, is relatively simple and tastes fabulous. Thanks for sharing your knowledge and culture.